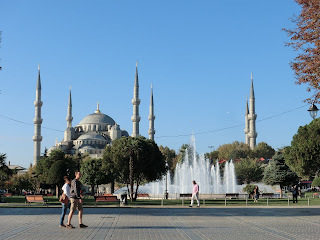 The Sultan Ahmed Mosque, also known as the "Blue Mosque"
This is not a trip for the idle. We are busy from early morning till evening. And Harun doesn't waste a minute as he spoon-feeds information into our heads. During our bus rides, he reads literature or explains the things we are seeing, as we gaze down at the sparkling blue shores of the Golden Horn. It's a beautiful, sunny day, and I feel refreshed. But how am I to make sense of the many things on the program for today? I guess it is spirituality that is impressing me the most today. My longing is to unite all these religions into one spirit. But it doesn't seem to work, and that makes me sad. This morning we visit the Hagia Sophia, on the same hill as the Topkapi palace. We learn that this structure is the model for almost all the mosques built ever since - but this was built as a church. There are minarets around this building, as with all the mosques, so at first it feels like just another mosque we are entering. The first thing you notice is the huge inscriptions in Arabic writing on placards on the walls. Then, when you look a little closer, you see that this building is full of mosaics with Christian motifs. It was built in 537 A.D. by the emperor Justinian. One of the spectacular things about this building is the feeling of light and space - you can't see any of the structural supports, which are hidden in walls. This church was the headquarters of the Eastern Church for hundreds of years until one spring day in 1453, when Sultan Ahmed turned it into a mosque. It remained a mosque until 1931, when it was secularized and turned into a museum in 1935. Harun explains that the Muslims only painted over the mosaics, taking care not to deface anything, because they also respected Jesus, Mary and all the Jewish and Christian prophets. For me it is sad to think of something that was once Christian lose its Christian identity. But how does God look at this? Perhaps the most comforting thing I gaze at this morning is a cat resting on the top of a railing inside the church/mosque/museum, unaware of all these religious conflicts, simply glorifying its creator by being. Peter is delighted to find a baptismal pool in a small building adjacent. 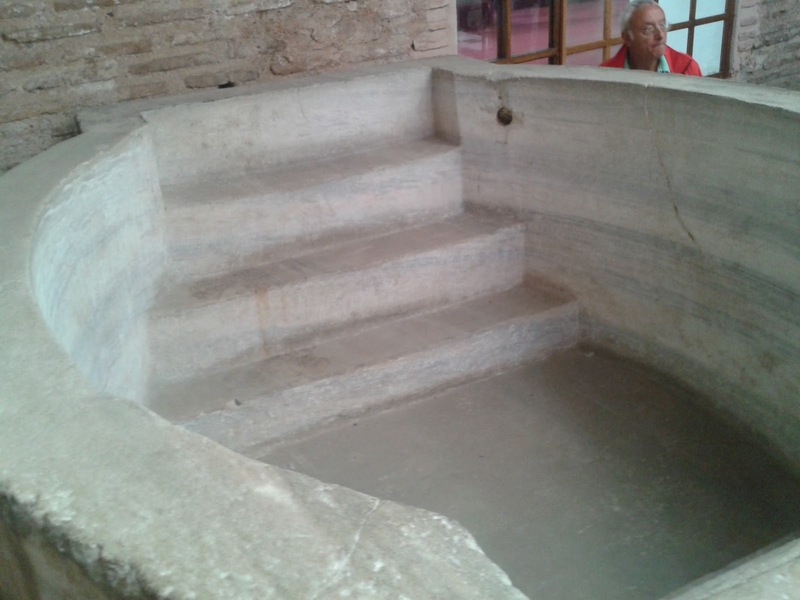 It is obviously a pool meant for immersion, proof that people were immersing believing Christians even into the 500s. The Hagia Sophia was a very important mosque for the sultans to worship in; there is a covered passageway between Topkapi Palace and the Hagia Sophia, and a special section for him and his entourage to sit in. From here we walk a few steps to the Basilica Cistern, also built around the time of the Hagia Sophia, during the Christian era when this city was known as Constantinople. It is hushed, mysterious, deliciously eery down here, with columns stretching along as far as you can see, reminiscent of an ancient church. The old town is full of these underground cisterns, but this one is the largest. 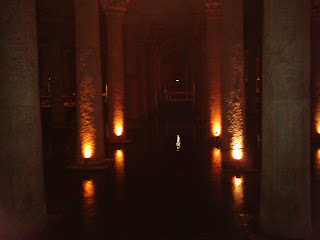 There is still water flowing down here in a huge shallow pool, illuminated by dim lighting. "I could imagine a crime taking place down here", I whisper to Peter, not knowing that this very cistern is used in the opening scene of the James Bond film "From Russia with Love", one of Sean Connery's time as 007, in 1963. After lunch, we walk over to the the Museum for Islamic Art. I'm too tired to take much in, so I leave the museum and browse in the bookstore. I find a book of Rumi poems which I buy and read for a while. Rumi was a mystic poet from Iran, but he lived much of his life in Turkey and was buried in Konya. This is a man who digs beneath the surface, getting to the bottom of things. Rumi is interested in sources, the ground of being. He's interested in heartfelt worship and a life dedicated to seeking God. 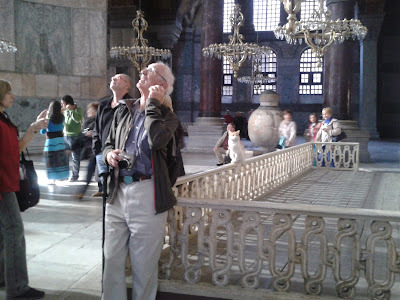 If you want to read a Rumi poem, go to the top of this blog under "Thoughts from Traveling Companions". By now I'm exhausted, but our day is far from finished. Harun pushes us on. We walk on to the "Blue Mosque", as the tourists call it because of the many blue tiles lining the walls. 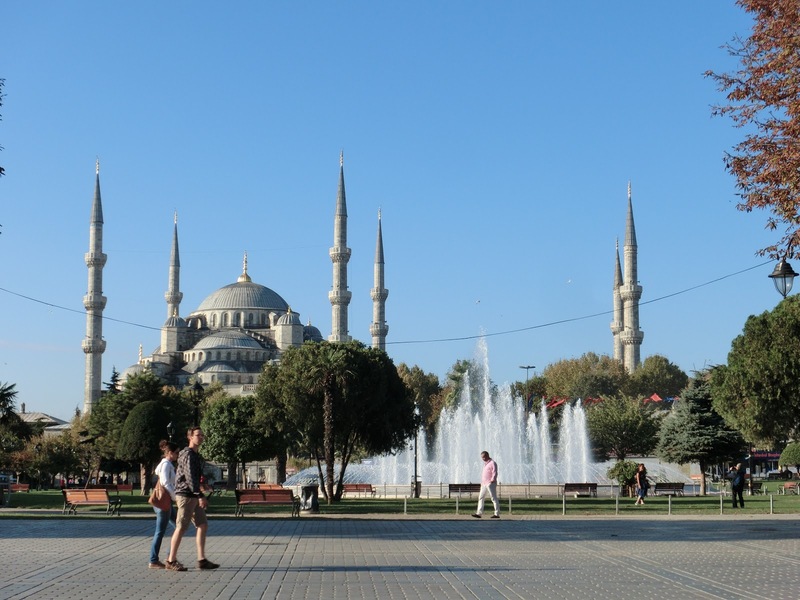 The Turks call it the Sultan Ahmed Mosque, honoring the Sultan who conquered Istanbul from the Byzantines. This mosque was built by Sinan, Harun tells us. We will encounter many mosques built by Sinan during this trip. This is a gigantic, very impressive building, but after being in the Hagia Sophia, the huge pillars supporting the building get in the way. 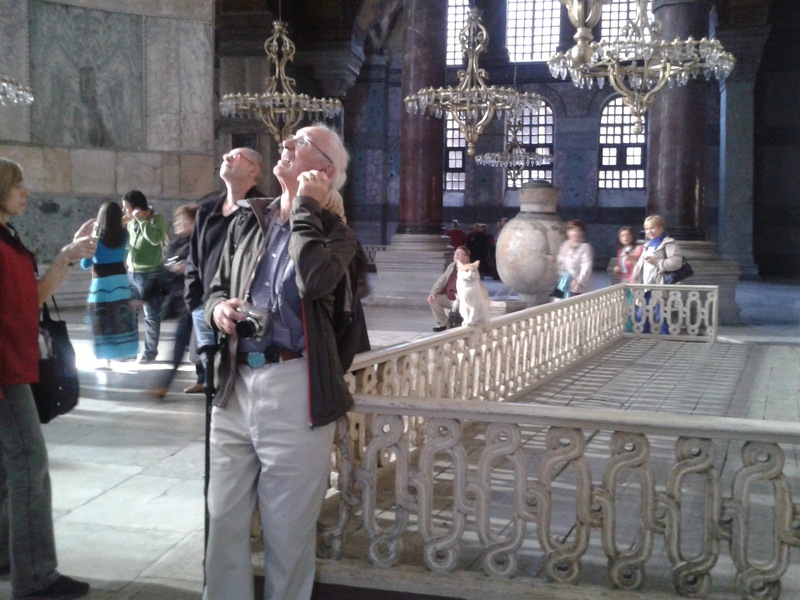 Sinan later learned to hide them, making the mosque similarly spacious, like the Hagia Sophia. Harun tells us about the Muslim call to prayer. Each time it is recited, there are some different elements, he says. The longest call is on Friday midday. The gist of it is, "Allah (Arab for God) is great, there is no one greater than God, and Mohammed is his prophet. Come to pray. There is no one more worthy than God." I wish I could reconcile all this with my Christian belief, but am not sure I can. Was Mohammed a prophet of God? That for me is the question. I hear Harun on this trip, Muhammed during my last trip to Egypt, praising their religion. The way they talk about it, it doesn't sound that much different in its goals from Christianity, as far as worship of God and morals go. But we Christians see Jesus as much more than a prophet. Through his word, the entire universe was created. Through Jesus' death, the entire universe was reconciled - all the sickness, darkness, sin and death of the universe has been overturned by the death and resurrection of Jesus. That is a different message than the Muslim one. And yet, I worship my Creator, my Sustainer - and my Saviour - with all my heart when I hear the call to prayer. I figure this prayer is meant for all to heed, Muslim, Christian, Jew, Buddhist, pagan, pantheist, anyone who has a sense of the supernatural. All the major sites seem to be within walking distance of each other. 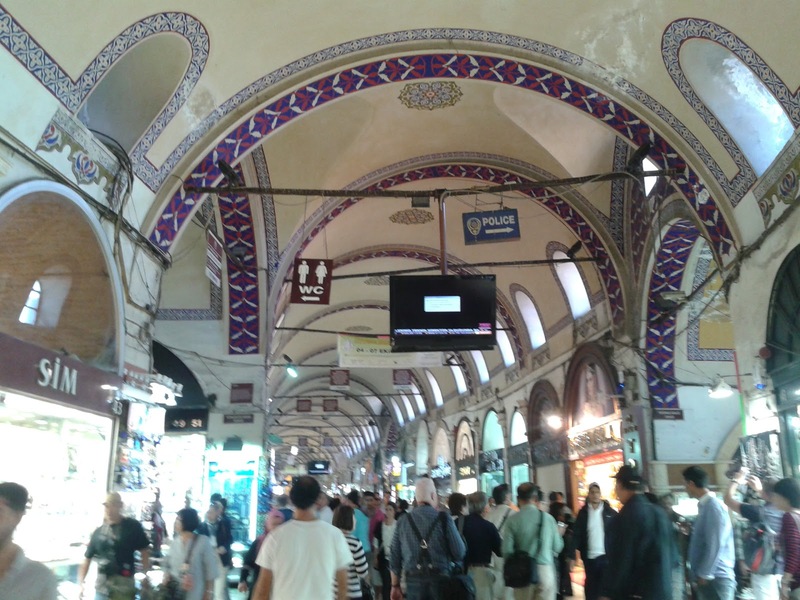 From the Blue Mosque, we walk on to the grand bazaar. I really look forward to this, remembering the fantastic maze of stalls in the Khan El Khalili bazaar in Cairo. But - I've been forwarned - through the guidebook, which tells me most of the private vendors have had to give way to big commercial undertakings. I'm not quite sure what this means, but I soon find out. 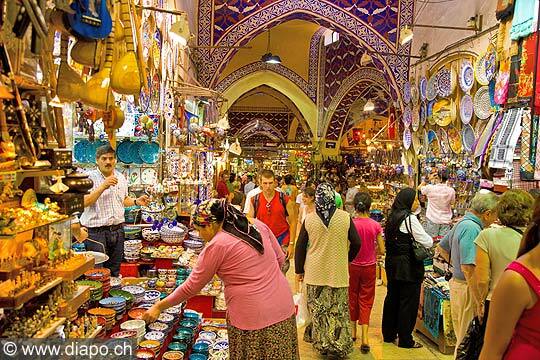 The bazaar is all under one roof, and Harun says it is so huge, you can get lost in it. Peter, a guy from our tour group and I enter the bazaar. It is attractive, with tiled walls and little signs to help orient the shoppers. But the shops are upscale, and many are the same ones you would see in a shopping mall - Benetton, Oilily, and Esprit. As we venture further into this mini-city, we see other stalls like those we were expecting to see - leather goods, scarves and clothes, jewelry and beautiful ceramics shops. I buy a small leather handbag and a coin purse. We sit down for a cup of Turkish coffee. Three days into this trip and still not a sign of abdominal problems. What a marvelous place Istanbul is! 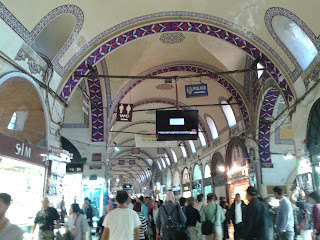 Harun grants us an hour to visit the bazaar, and then we meet to walk to the bus, which will take us to our hotel. On the way, we pass an inviting large, old building. Harun explains that it is the Cemberlitas Hamam, one of Istanbul's oldest, most prestigious old bath houses. I make a mental note to go there another day. Today we have no more time, although we could probably all use a massage. After walking all day, we are all so tired we can hardly take in another fact. But, tireless Harun (do I see sagging shoulders and wrinkles of exhaustion even on his face? ), explains the city's plans for renovation as our bus lumbers up the hill to Taksim Square. We stumble out of the bus as soon as we reach the hotel. Peter wastes no time in climbing into bed for a nap. I type notes about the day in my laptop. At 7 pm, we all pile back on to the bus. We're all going out for dinner. Back down the hill, this time through a traffic jam that is tame, compared to those we encountered in Cairo. Tireless Harun reads to us from a book by Orhan Pamuk. He reads a passage about Beyoglu, the part of the city we're staying in. The story is interesting. Old Istanbul used to have so many cultures living together, something else this city has in common with Cairo and Alexandria. But many of the foreigners have left. Our bus ride takes us past the road leading to the Topkapi Palace and along the Bosphorus for several minutes. Finally, we stop at a location that looks almost creepy, it is so empty and dark. But as soon as we pass through an underpass, we enter a crowded, lively little village called Fenerbahce, where we are surrounded by people on their way to, or already seated in fish restaurants or taverns, enjoying the night life. But we're going to a kebab restaurant, the Develi, where we're supposed to get excellent Anatolian grilled food. We get the rooftop all to ourselves, and we have a marvelous view of the village and the twinkling lights along the Bosphorus. I invite Harun to sit with us at our table. He declines. He's going to eat with the bus driver. We sit with a nice couple who live in Belgium. The people on this tour are all friendly and uncomplicated, which is nice for us, but perhaps a little boring for the blog! I have no one to complain about. Not the food either. The food is much better than any of the Turkish food I have eaten in Germany - and plenty of it! Fried meatballs, an eggplant appetizer, feta cheese, beans, hummus, a salad with pomegranate balsam, delicious homemade pita, three kinds of grilled lamb dishes, and flaky, tender, buttery baklava for dessert. If only we could sleep off all this food and laze around tomorrow. Harun leaves us to our own thoughts and full tummies. We wouldn't pay any attention to him anyway. The dark road and gentle rumble of the bus lull many of us into dozing as we return to our hotel for the night. I have enjoyed my meal so much, I feel almost drunk on it. One day back in Germany, when I've had enough of feasting, I will fast. I think of the words I discovered in Rumi, earlier in the day: "There's a hidden sweetness in the stomach's emptiness. We are lutes, no more, no less. If the soundbox is stuffed full of anything, no music. If the brain and the belly are burning clean with fasting, every moment a new song comes out of the fire." This evening my entire being has been sung to by delicious food, nice company, and a view of the waters of the Bosphorus. And now I am ready for sleep. There is plenty of time another day for fasting.